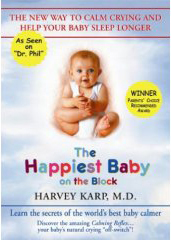 The DVD also contains 3 bonus chapters: 1) Dr. Karp answers 25 questions from parents about calming babies and helping them sleep. 2) A Spanish dubbed audio track of the entire 38 minute teaching video. 3) Three tracks of calming white-noise sound that is an extraordinary mix of womb sounds and a newly designed pulsation that babies love (even though it sounds a little odd to the ears of an adult) Each track can be played individually, played in sequence or repeated for hours to gently guide your baby into a deep level of relaxation. This video is designed in NTSC not PAL or SECAM. It is meant for use in most countries in the Western Hemisphere as well as Japan, South Korea, Greenland, Guam, Samoa, and the Philippines.